Chances are that the first piece of advice most apnea patients get, during their first consultation with the sleep specialist is to lose weight. Though most of us, especially those who are obese, know the ill effects of obesity, we may not immediately be able to co-relate sleep apnea, a breathing-related disorder with body weight. If you are obese and facing the brunt of this distressful sleep disorder, there are many aspects of this harmful association that you want to know about, which is not limited to merely sleep apnea and weight gain. Let us therefore begin our knowledge quest with the prevalence of sleep apnea and obesity. We use the terms obesity and overweight thinking that they are one and the same. However, for the medical management of these conditions, it is necessary to know the subtle difference that exists between the two. According to World Health Organization, obesity and overweight are related to Body Mass Index (a measure of body fat content in relation to height of the individual). 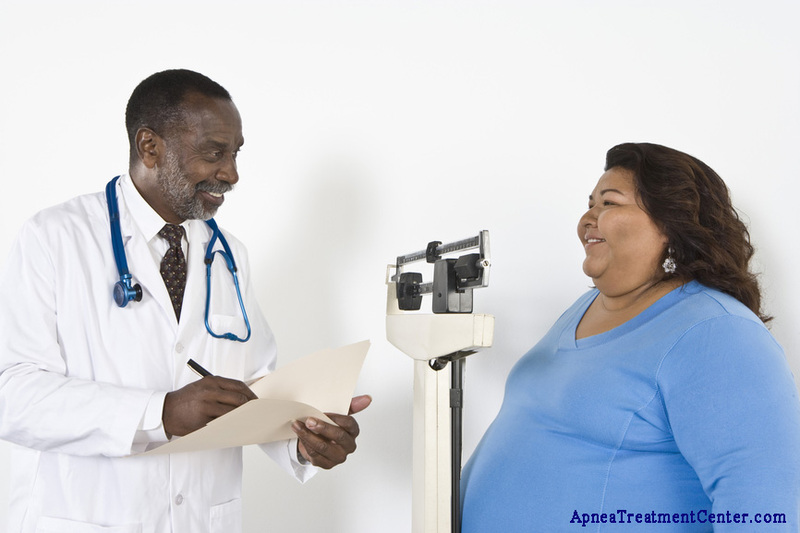 We call an individual overweight when his or her BMI is between 25 and 29.9; obesity is when the BMI is 30 or more. For making things simpler, you know you are obese when your bodyweight is 20% more than the ideal figure. Take this news any which wa y you like but it is estimated that between 60 and 70% American adults are either obese or overweight. This means close to 75 million adults are suffering from obesity. What are the likely health complications that these obese adults suffering from? – According to National Sleep Foundation 2003, Sleep in America Poll, 77% of obese older adults suffer from sleep disorders. – 70% of those diagnosed with sleep apnea are obese or overweight. Two reasons have been attributed to the growing instance of sleep apnea in America, the first of which is of course, timely and correct diagnosis. But the second reason is due to growing rate of obesity. From the 1990’s when only 3% of Americans had sleep apnea, a study published in American Journal of Respiratory and Critical Care Medicine in 2002 mentioned this figure to be 5%. The same figure rose to 9% in 2009. This means that in less than 20 years, the instance of sleep apnea has nearly doubled. There are seve ral risk factors that can be held responsible for the onset of this ailment. But of these, two factors stand out: smoking and obesity. Both these factors are fortunately reversible and are related to poor lifestyle choices, which can again be rectified. Smoking can cause inflammation of the upper airway and retention of fluid which lead to sleep apnea. As far as obesity is concerned, it is difficult to say, which comes first – obesity or sleep apnea. On one hand, obesity is one of the primary triggers for sleep apnea, but on the other, sleep apnea and weight gain shares a mutually-dependent relationship. A study that was presented during the yearly conference of Associated Professional Sleep Societies, called Sleep 2009, it was shown that patients with AHI over 15 had an increased BMI of 0.52 kg/m2 but those whose AHI score ranged between 5 and 15, the increase of BMI was only 0.22 kg/m2. Incidentally, the AHI score is one of the most important indicators of severity of sleep apnea and is determined by a combination of hypopnea and apnea episodes in an hour of sleep. – Risk doubles with 10 kg rise in bodyweight. – Risk can go up 4 times with a 6-time increase of BMI. 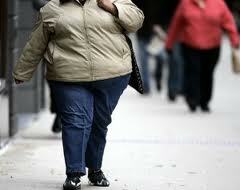 – Increase between 13 and 15 cm of hip and waist circumference can multiply the risk by 4 times. How is weight gain part of the disease condition? With the backdrop of the fact t hat close to 18 million Americans are affected by sleep apnea are overweight, let us explore the rationale behind such common linkages. Margaret Moline and Lauren Broch, both of who are specialists in New York Weill Cornell Medical Center, believe that when a person puts on excess weight in the neck and trunk region, it leads to increased chances of developing sleep-related breathing problems caused by poor functioning of the respiratory system. Sleep apnea not only causes physiological problems, but many of its effects affect the mind too. For example, continued sleep deprivation causes daytime lethargy and hinders a patients’ motivation to diet or exercise. This makes it harder for such individuals to maintain or even continue any dietary regimen or weight loss program. Studies have also been done that reveal that people who sleep less experience hormonal imbalance which can impact their future body weight as well as damage their health in the long term. Sleep deprivation is very closely associated to obesity and even healthy adults, who are not overweight, can move towards obesity, if they do not get adequate sleep. Accordingto Dr. Eve Van C auter, researcher on this topic, chances of physiological deviations are imminent for patients who experience repeated sleep interference. This in turn, confirms sleep specialist Richard Simon, in Walla Walla, WA can result in an abnormal increase of appetite as well as intake of excess calories. To understand the interplay of appetite-related hormones and sleep apnea, you need to know about the profiles of two hormones: Leptin and Ghrelin. While Ghrelin is responsible for stimulating appetite, Leptin is the hormone that is linked to satiety (feeling of fullness). For a sleep apnea patient, who is majorly sleep deprived, the Leptin levels drop. This means that you are never satisfied even after eating adequately. Simultaneously, the Ghrelin levels rise due to lack of adequate sleep. This results in increased appetite and the tendency to overeat. The combined effect of the interplay between these two hormones results in gaining excess weight. The link between sleep apnea and obesity is part of a vicious conundrum which starts and ends at the same place that is, poor sleep quality. Insufficient sleep makes us tired and lethargic the next day which stops us from doing any physical exercise, which compel us to eat more and put on excess weight. This is the route to obesity-related health problems, the most important of which is sleep apnea, which again causes poor sleep. How to treat sleep apnea and weight gain? The obvious answ er is hidden in the question itself: losing weight may not be a cure for sleep apnea, but definitely can go a long way in alleviating symptoms and allow the patient to get good sleep. While one of the best ways to come out of the obesity problem is to cure the concealed medical condition, most doctors support CPAP therapy as a way to treat sleep apnea. The rationale behind this is that CPAP assures comfortable sleep for the patient, which in turn can motivate the individual to initiate as well as continue some kind of effective weight loss program. Doctors Broch and Moline opine that a weight loss of even 10% can result in significant reduction of severity of the condition. In one study, it was found that the decrease of apnea episodes was disproportionally larger than the amount of weight lost. However, it should be kept in mind that CPAP therapy cannot help in weight loss; it merely makes you sleep better to enable you to pursue weight loss programs better and lose weight faster. So how should an obese patient who is suffering from excessive sleepiness during the day and other tell-tale symptoms of sleep apnea do? To begin with, the patient should understand that his or experiences are related to sleep apnea. Then ask the physician for a recommendation to go for an overnight sleep study or polysomnogram, which will determine both the severity as well as location of obstruction in the airway which is causing sleep disturbance and breathing distress – the real reason for daytime sleepiness. 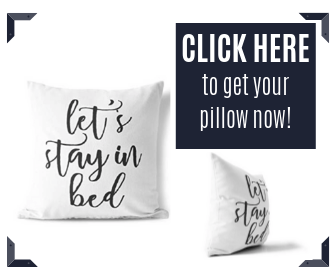 Bed or room partners are important contributors in the final diagnosis of the patient as he or she can narrate other symptoms which the patient displays during sleep but may not be aware of. Doctors also recommend polysomnography, after 10% weight loss as well as improvement of symptoms. As a precautionary step, obese individuals should proactively go for a physical check-up for screening against obesity-related health conditions. Checking the neck circumference is an important indicator. For men who have neck circumference more than 17 inches and women 16 inches, there is an increased risk of developing sleep apnea. 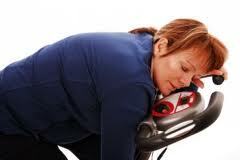 It is to be noted that there is no standard weight loss therapy for the management of sleep apnea and obesity. Doctors prefer to prescribe individualistic weight loss solutions to suit the patients’ lifestyle, current health condition, present medications, etc. Hydrotherapy for obese patients with arthritic problems, immobility, etc and joining weight loss programs which are popular in the locality work effectively. Obese patients with sleep apnea usually look for support from community and family, including spouse to keep them motivated to lose weight. Eating little does not help in weight loss but eating right is more important. A qualified dietician can work out the calories needed and design a balanced diet plan for the patient depending on his or her present health condition. Weight loss medicines are also prescribed by some doctors to help obese patients affected by sleep apnea. 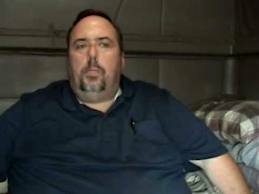 Can surgery be the solution for obese apnea patients? There is no direct answer to this question, as it is normally a joint decision taken by a heart specialist, sleep doctor as well as a psychiatrist. However, strict monitoring of the condition is necessary after the surgery. While there are now various quick and easy online opportunities available for self-diagnosis of sleep apnea, recently a new self-evaluation device has been introduced called the Watermark Apnea Risk Evaluation System (ARES), which appears like a headband and records many facets of sleep, which are indicative of sleep apnea. Apparently, both the insurance companies as well as the medical fraternity have welcomed this affordable and non-invasive self-diagnosis tool. When we think obesity, our thoughts immediately focus on the abdomen, hips, thighs, etc. But unseen obesity can majorly impact the breathing muscles, especially those located at the base of the tongue. Excess fat tissues accumulated on the muscles of the neck can make the inner airway narrow, causing impedance to airflow during breathing. For strengthening and toning of breathing muscles which have become weak and floppy due to obesity, specially designed sleep apnea exercises can be done to improve the condition. The primary aim of these exercises (of the tongue, jaw and throat) is to improve the functioning of the soft palate, palatopharyngeal arch as well as nasopharynx. Some examples include yawning, singing, practicing didgeridoo, gum chewing, etc. They are known to reduce the amount of distress experienced as well diminish the frequency of apnea episodes significantly. Over and above putting the obese apnea patient on CPAP, some doctors also prefer using dental appliances to ease the symptoms of apnea. These devices which work on the principles of advancement of lower jaw and/or holding back a receding tongue are good alternatives for patients who are CPAP-noncompliant. Agreed, sleep apnea and weight gain is a complex concept to understand and sleep apnea and obesity, an even more serious health condition to manage. But at the end of the day, if we understand how even a 10% weight loss can actually improve the way we sleep, helping us to control our weight better, we ought to be a bit more tolerant with CPAP. Though this may be highly uncomfortable in the early days of use, if you believe that you have a right to breathe and live better, then all the hurdles to achieve this goal seems easier to overcome.